“Natural as Mud” is the company logo and while I’m not sure I would lump this into the same category as mud, my girls will be finding this nail polish in their Christmas Stockings. The product line is free of formaldehyde, toluene, phthalates, biphenyl A, ethyl acetate and acetone. The ingredients are listed as: Water, water-miscible acrylic and polyurethane film formers and thickeners (well below 100 parts per million), glycol ethers. May contain mica, D&C red lake, ultramarine blue and chromium, iron and titanium oxide pigments. The colors are fun, vibrant and sure to please any little girl (and Mommy as well). Available in colors such as Forever Fancy, Sometimes Sweet, Dandelion Kisses, Ice Cream Dream, and Mac-N-Cheese, Please! Even the names are kid friendly. The website includes tips for entertaining squirmy little bugs during polish drying time. (You should allow to air dry for 60 seconds, then set with a hair dryer on low air/medium heat for 1 minute.) This is helpful as my youngest is always taking off before her nails are dry, leaving smudges everywhere. The site also talks about the learning that can go on during painting (in addition to the natural Mother/Daughter bonding that occurs during girl time). A bottle will run $9.99 or a set of three for $26.50. Right now, Piggy Paints is offering FREE SHIPPING on all orders over $25.00 (not hard to do, my current wish list hit $60.) 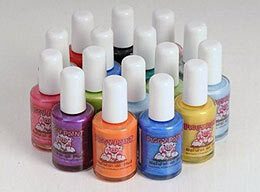 Be sure to order a bottle of the non-toxic, odorless Piggy Paint Polish Remover ($10.50 or in a kit with two polishes for $27.50). 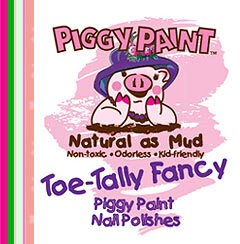 You can purchase Piggy Paints online or at fine retailers in select states. Great tip! My daughter is 3.5 and always wants her nails and toes painted and it sickens me. I totally want some of this for her!! Awesome! Thanks for this product tip. Was wondering, after the previous post, how to convince my daughter that her first bottle of nail polish ever was now off limits. Very cool! I’ll even use it!